This print by Paul Fourdrinier combines two printmaking techniques - etching and engraving. Both involved creating a pattern of grooves to hold ink in a metal printing plate. The image on the printing plate was the reverse of the final image. The etched lines were made using acid, while the engraved lines were scored by means of a sharp tool called a burin. The grooves were then filled with ink and the image was transferred onto a blank sheet of paper. 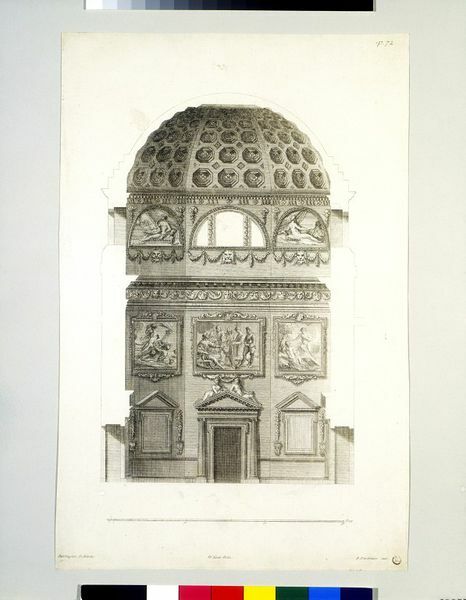 The print comes from a book called The Designs of Inigo Jones, Consisting of Plans and Elevations For Publick and Private Buildings. Publish'd by William Kent. With some Additional Designs. It is one of the 'additional designs' since it is by Richard Boyle, 3rd Earl of Burlington. Burlington was the chief promoter of the Palladian style. He provided financial backing for the book and it reproduced drawings in his collection. A self-promotional motive was also in operation. The book implied that Burlington was the natural successor to Inigo Jones, the outstanding architect of the 17th century who had introduced true classicism to Britain. The booksellers James Woodman and Daniel Lyon took 380 advance subscriptions for this book. Only subscribers could buy it when new, as it was not for sale in bookshops. 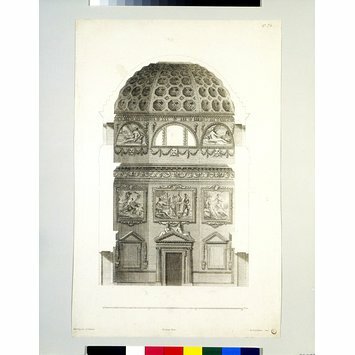 William Kent (after), plate 72 from 'The Designs of Inigo Jones Consisting of Plans and Elevations for Publick [sic] and Private Buildings', London, 1727.